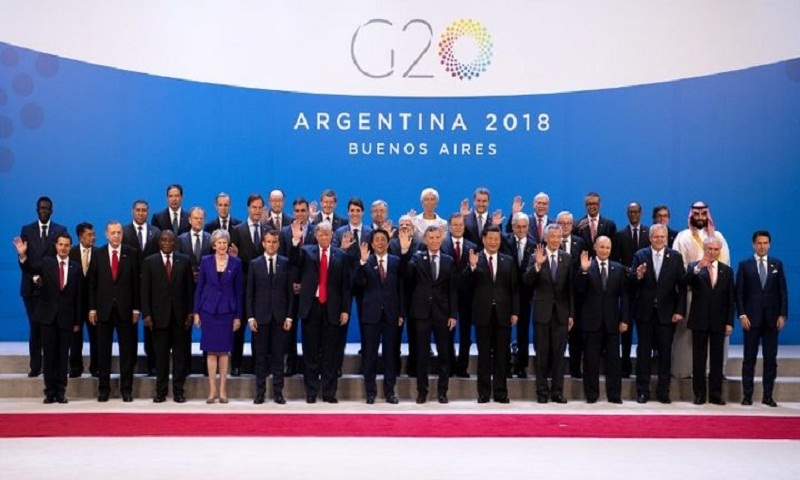 World leaders have held the opening session of their annual G20 summit, with any number of disputes and disagreements on the table. Host president, Argentina's Mauricio Macri, said the solution was "dialogue, dialogue and dialogue" and called for a clear message of shared responsibility. But US President Donald Trump has already cancelled meeting Russia's Vladimir Putin over Ukraine. And huge differences remain on climate change, trade and the Khashoggi affair. The G20, made up of 19 of the world's most industrialised nations plus the EU, accounts for 85% of the world's economic output and two-thirds of the world's population. Its meetings, which began in 2008, are an opportunity for members to develop global policies tackling major issues - but many of the key decisions will be made in one-on-one encounters. There is massive security for the summit in Buenos Aires, with a bank holiday declared for Friday and the city's main business district shut down. Protesters angry at the money spent on the summit while Argentina struggles through tough austerity demonstrated outside the meeting.